Sanderson Farms, Inc. (SAFM) is going to get a boost by resuming chicken shipments to Russia. As it stands, it is already pretty cheap, trading at just 9x forward earnings, well under the industry average of 14.1 and easily in the range of a traditional “value” stock. The Russians have been banning U.S. chicken since January due to a disagreement over a chlorine rise used by American meat companies but just recently agreed to lift the ban. Sanderson Farms is the fourth largest poultry producer in the United States. It operates 9 poultry plants with another looking to come online shortly. The company processes more than 8.8 million chickens per week. According to Reuters, Russia is the second largest importer of U.S. chicken after China so it’s import moratorium was stinging the chicken producers, including Sanderson, over the last 6 months. Russia’s decision to re-start imports will help but it will likely take a month or two for the decision to impact Sanderson’s bottom line. On May 25, Sanderson Farms reported its fiscal 2010 second quarter results and it was another quarter of surprising on the estimate despite its exports lagging. Earnings per share were $1.62 compared to the Zacks Consensus of $1.44 per share. The company made just $1.25 in the fiscal 2009 second quarter. 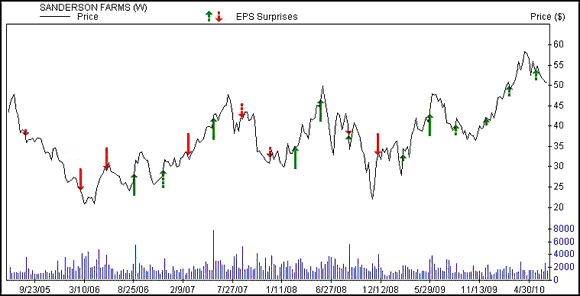 You can see that the company has put together quite an earnings surprise streak, beating in the last 7 quarters. Sales jumped 14.1% to $487.1 million from $426.8 million in the year ago period. “Demand for chicken at retail grocery stores remains strong and the ongoing issues we and our industry face in export markets have not yet significantly disrupted the markets,” said Joe F. Sanderson, Jr., chairman and chief executive officer. “As has been the case for two years, demand from some food service customers continues to be adversely affected by the economic downturn as demand for protein consumed away from home remains soft,” he added. The company also sold 16% more pounds of fresh chicken during the quarter which allowed it to reduce its average non-feed related costs per pound. Combined with the recent news that producers can begin to export to Russia again, the analysts are optimistic too. The fiscal third quarter Zacks Consensus Estimate is up a penny to $1.91 in just the last week. The fiscal 2010 Zacks Consensus has also been on the move. It climbed 2 cents to $5.59 per share as 1 estimate moved higher in the last 7 days. That is earnings per share growth of 40% compared to fiscal 2009. Sanderson Farms has some good value credentials in addition to its cheap P/E ratio. It has a price-to-book ratio of 2 which is inline with its industry and also within the value parameters. The price-to-sales ratio is just 0.6, under the industry average of 0.8. Over the last 5 years, Sanderson Farms has averaged a solid return on equity (ROE) of 11%. Sanderson Farms is a Zacks #1 Rank (strong buy) stock.